You can buy the Sailuns at simpletire.com for $134 delivered. I got mine there and they were delivered in four days. Fresh dates on the tires. Exactly what I did , I have 4 tires on the way should see them by Thursday. 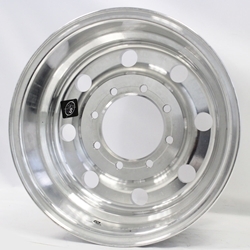 I got a quote from a vender on Alcoa forged truck wheels that are modified to fit trailer centering hubs ( 4.88" pilot hole and cone style 9/16 lugs) . Yes these are slightly more money then but I feel a wheel that's rated for 6000lbs is better then the sand cast wheels that most other brands offer and these are good looking aluminum wheels. I think this year where we just got the 5th wheel last fall I am going to have to do this work in stages. dropping $9000 for IS 8K , disk brakes and 17.5 tires and wheels is more then I can do right now. Morryde is currently booking for Aug and I have no chance of getting to Elkhart before late sept- Oct. I think I may take on the disk brake kit install from Performance trailer brakes myself. I spoke to Michael on Friday and $1925 is what he said the kit would cost plus $1000 install no mater who is doing the work (his crew or Morryde). I have morethen enough experience in the automotive repair business to get this done so I am going to save $1000. It really nice to see so many well informed owners and there spot on assessment of the aftermarket industry. We had 8K IS and disc brakes installed by Moryde on our 2014 31SL this past September 2017. We noticed improvement immediately in braking and ride. As Piper Guy said Just do it. You won’t regret it. A comment about Moryde service and support You won’t find a better company to deal with. They set the standard for service and support. Full time for two years. Performance Braking is the company. They are no longer offering Sailun tires. Along with Goodyear they are now using Ranier (sp). If that's true it won't take long before they get a Bad Rep, as Ranier rates right up there with the GY Marathons for problems. Good friends went thru all five (even the spare) Raniers when we did the Canadian Maritime Caravan. So I got the green light from my wife and pulled the trigger and upgraded to MorRyde 8000lb IS and disk brakes. On March 23 we had a over night snow storm so I left the house around 10 am so the snow had a chance to melt and roads cleared quickly that morning. I drove strait out to Milton PA where I did a overnight at my cousins house just off of Interstate 80 (about 385 mile first leg). the next morning I got on the road early and made the next leg to Elkhart , I pulled into Morryde around 5:30 pm , called my wife to let her know I was there and I am going to get some dinner. (traveled by myself) At this point I looked at the trailer and noticed the drives side tires where really close to touching each other. looking at it closer I found the wet bolt in the spring hanger had broke and the spring is now riding on the bottom rail of the frame! I think this may have happened some place in Ohio , I heard a load bang and felt it in the truck. I thought to myself was that a tire so I slowed to a stop and checked , It was not so right back to the drivers seat and hammer down! Fast forward that was the bolt breaking in the middle but still thru the spring , add a few more hundred miles of pounding on roads that need repair and the hanger opens up and lets the spring hit the frame and the bolt half's drop out of the hanger. Had I not had 17.5" H tires and had the luck of a Irish man four leaf clover I would NOT have got to the morryde factory without a road side repair. As for the upgrade , Ride wise its much better. Everything stays where I left it even if it was on the kitchen counter. Disk brakes are so much stronger , I know I can stop in a panic at highway speeds with cars. That never was possible with 7K drum brakes even adjusted good. all I can say is buggy springs are Ok on a lighter travel trailer but don't belong on anything this long and heavy without shocks and something to control the forward and backwards motion. post morryde upgrade weight 17600 lbs on a 2015 RL38 3400lbs on the pin , 14200 lbs on the tires so 8K is the correct one to get. would I do it again , FOR SURE! most likely would not wait. outside at morryde they had IS sitting on the ground so you can see what it looks like.